The fact Russian President Vladimir Putin was the first foreign head of state invited by newly elected French leader Emmanuel Macron speaks volumes of a desire to reset frayed relations between the two countries. Their meeting began with a cordial handshake and continued in the same vein for most of their subsequent joint news conference. It was only at the end that Macron slipped into an acrimonious tirade, accusing Russian news media of acting as fake news outlets against his election campaign. After US President Donald Trump’s rancorous meetings with European leaders last week there seems to be a renewed push for the European Union to find a more independent position from Washington. German Chancellor Angela Merkel’s call this week deprecated the United States as no longer a reliable ally. Macron’s outreach to Moscow seems to be part of this emerging trend for Europe to chart a freer path toward Russia. Barely three weeks after winning the French presidency, Macron hosted Putin at the Palace of Versailles, near Paris. To get the meeting set up so quickly Macron’s election team reportedly invited the Russian president the day after the election on May 7. The haste in inviting Putin shows Macron is keen to restore friendly relations with Russia – relations that had badly deteriorated under his predecessor Francois Hollande who followed a futile policy ordained from Washington of trying to isolate Russia internationally. At age 39 Macron is nothing if not ambitious. His meteoric rise from being a Rothschild investment banker to become economy minister in the Hollande government, then resigning that post to set up his own political party in time to win the presidential election, points to a man who is an agile operator. During the election campaign, he presented himself as a leader who would be tough in dealing with Russia. Unlike chief opponent Marine Le Pen who expressed markedly pro-Russian views, Macron projected an image of standing up to Russia on geopolitical matters. 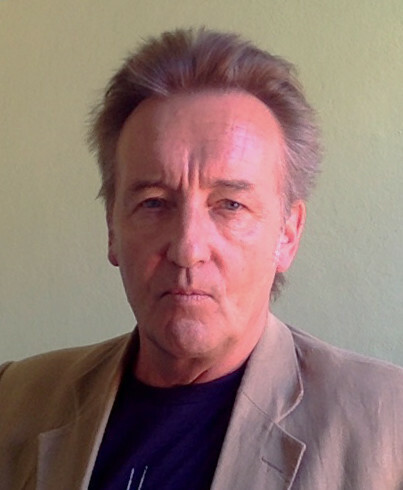 His invitation to greet Putin this week is hardly a sign of a sudden conversion to detente. Macron is being pragmatic and ambitious. He said that nothing could be achieved internationally without engaging with Russia. By engaging with Putin at the earliest opportunity, Macron is carving his image as a strong world statesman. Last week during the NATO and G7 summits in Europe it was telling how Macron sought to establish himself as a formidable leader. His deliberate show of strength in the vice-like handshake with US President Trump, to the preferential embrace of Germany’s Angela Merkel leaving Trump momentarily in the lurch, were all subtle signs that Macron is intent on “making France great again." When he greeted Putin, there were no antics of power-play handshakes. There was nevertheless plenty of symbolism on display. 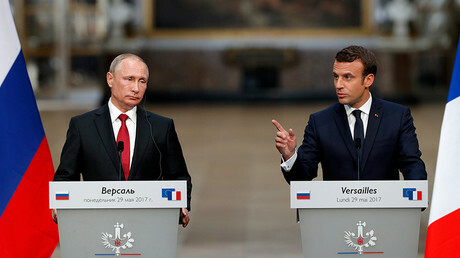 Strolling through the 17th Century Versailles Palace, Macron repeatedly referred to the historical and cultural bonds between France and Russia. “History is greater than any of us,” said the French president during the news conference. That was evidently meant to signify long-term mutual relations between France and Russia being more important than short-term political differences. The official occasion for their meeting was to celebrate the 300th anniversary of the visit to Versailles by Peter the Great in 1717, the Russian Czar who is lauded for introducing modernizing reforms to his country. Macron implied that the czar’s historic visit to France was a one-way learning process, with Russia benefiting from French enlightenment. When it came to Putin’s turn to address the news conference, he too acknowledged the wealth of common cultural heritage, but he reminded his French host that before Peter the Great’s visit, Russia’s Queen Anne famously bequeathed France with much cultural and political progress as wife of Henry I during the 11th Century. It was an apt riposte to remind the French president that any relationship between the two countries must be mutually respectful and not a one-way street. Macron spoke about having a “frank and direct” conversation earlier with Putin on a range of matters, including allegations of gay rights abuses in Chechnya. For his part, Putin did not say if he had brought up Russian concerns about French police brutality toward Arab minorities in French inner-cities. But why not, if French politicians feel entitled to probe Russian affairs? In any case, the abiding impression from the meeting – at least what we saw in public – was Macron’s willingness to restore better relations with Russia. The rapid invite to Putin and the historical backdrop of the Palace of Versailles were suggestive of that willingness. So too was Macron’s apparent desire to avoid contentious issues while speaking alongside Putin. The emphasis was very much on partnering with Russia to defeat jihadist terrorism and avowedly creating peaceful settlements in Syria and Ukraine. 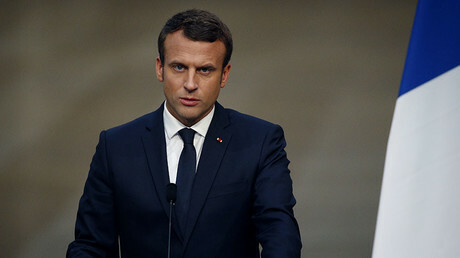 It was notable that during his address, Macron did not bring up allegations of “Russia annexing Crimea,” nor of “Russian aggression” in Ukraine and toward Europe. Macron also did not mention allegations of Russian “cyber attacks” and “electoral interference.” Nor did he bring up accusations made by the previous French government of Russian complicity in “war crimes” in Syria. What that indicates is this: firstly, Macron is being pragmatic in order to advance bilateral relations. Dredging up anti-Russian allegations is not only futile, it is counterproductive and damaging. Secondly, it shows that the allegations against Russia which have dominated Western political and media discourse over recent years are hardly credible. 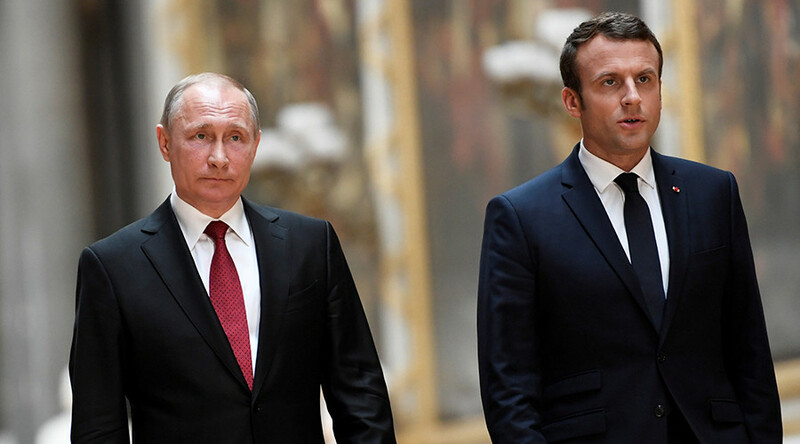 If there was any substance to the various Western grievances, it seems odd that Macron did not even mention them while standing alongside Putin in Versailles. It was only when Macron was challenged by an RT journalist about his election campaign team banning Russian news media from his electioneering events that he became animated. Macron reiterated baseless claims that Russian media had acted as “fake news propaganda agents” in a bid to damage his presidential campaign. It was a curious display of defensiveness by Macron. The real story here is more likely that Macron and his campaign team were the originators of fake news by making spurious accusations against Russia media. That could have been an attempt to play the “Russian card” to whip up patriotic votes. The fact is that no evidence has ever been presented of either Russian cyber attacks in the French election or of Kremlin-sponsored media influencing, as Russia’s Foreign Minister Sergey Lavrov commented this week in response to Macron’s latest outburst. If it were such a real issue then why didn’t Macron bring it up centrally in his news conference with Putin? As with many other anti-Russian narratives, Macron didn’t because there’s nothing to these claims. Macron’s ambitions of being a strong world leader tell him he needs to abandon silly anti-Russia games and start treating Moscow with respect.